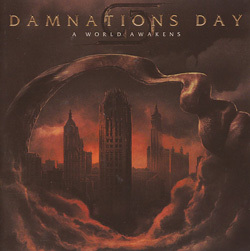 The latest cannon in the arsenal that is the growing Australian metal scene, Damnations Day can trace their roots back to 2005 when Mark and Dean Kennedy starting playing together, as guitarist/vocalist and drummer respectively. Things got a lot more serious in 2012 when lead guitarist Jon King hooked up with the brothers, and an album, ‘Invisible, The Dead’ came the following year. Purely as a point of reference, if you draw a Venn diagram with Evergrey, Fates Warning and Megadeth in as subsets the intersection – the part where everything overlaps – will sound something like Damnations Day. Sitting on the heavy end of the progressive spectrum ‘A World Awakens’ – their first release for Sensory – is crafted from the same metal as its 2013 predecessor, but with the time in-between releases invested in touring and supporting a diverse range of acts from Nightwish to Accept the quartet have grown immensely in stature and confidence. That’s not to say that ‘Invisible, The Dead’ was a slouch by any means, but ‘A World Awakens’ takes the band a giant leap forwards and in doing so towers above contemporaneous releases by other bands in the genre. It’s heavy – no question about that – but controlled, and this restraint brings a degree of maturity and depth to the band’s multi-dimensional material. Much of Damnations Day’s immediate impact springs from the soaring vocals of Mark Kennedy, a man with a seemingly effortless range, and from the strength of the songs he and his bandmates (the line-up is completed by producer and bassist Dean Wells) have written together. Powerful, driving arrangements with staccato riffs and fluid solos – check out ‘The Idol Counterfeit’ – combine to produce a combative, no-nonsense but extremely exciting and diverse offering from a band with a great deal to offer. Given that this album could be the one that makes the metal community sit up and notice this incredible band, ‘A World Awakens’ is indeed the most apt of titles.